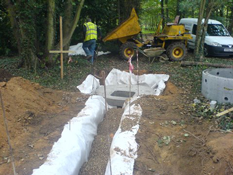 M J Services has a vast experience in all forms of Drainage. Our technical ability to fully assess and provide you with viable drainage solutions, including problems associated with damp caused by poor existing drainage or guttering & down-pipes. Septic tanks are vessels that are specifically designed to receive all types of sewage, then hold it for a period of time and eventually release a filtered, treated effluent. 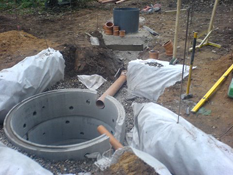 A septic tank is generally a liquid/solid separation system. As the name septic implies, the sewage that is entering the tank eventually becomes septic. It is possible that at sometime, smells can be detected from somewhere in the drainage system. These occurrences can be minimised by a correct installation and appropriate choice of location as well as controlling the sewage inputs into the septic tank itself. 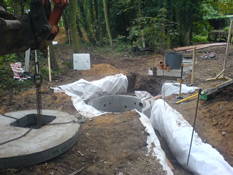 We can install new septic tanks and also reftrofitt existing septic tanks. MJ Services install Marsh Indutstries retorofit system, Uni:GEM Retrofit Domestic. The UniGem is a secondary treatment system or polishing system which has a unique retrofit design. The Unigem can be installed when you have effluent discharge problems with your existing sewage treatment plant or system. This retorfit system can help you to achieve a better discharge standard from your existing installation. The Unigem unit can be retrofitted by MJ Services to your existing septic tanks and some cesspits/cesspools that have sufficient existing volume for sludge containment .The Unigem unit can be easily connected onto the discharge pipe of your septic tank or a connection may be able to be made from your cesspit by MJ Services to connect to the Unigem unit as shown. This will give you a superior discharge standard which can be designed to suit most discharge requirements from the local water company or Environment Agency. Please note that if you wish to upgrade your existing septic tank or cesspool, mains power will be required to the site to run the Unigem unit and installation of the electrical system should be carried out by a qualified electrician or tradesmen.